READY FOR SUMMER! 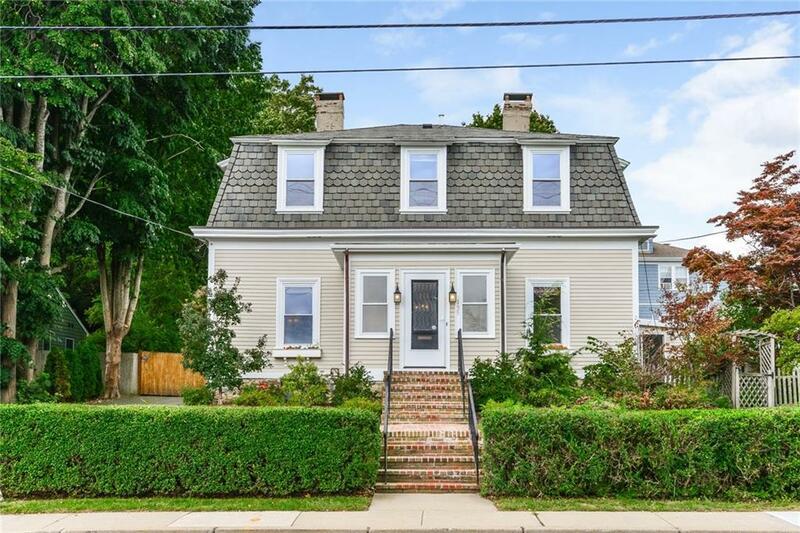 Charming Victorian cottage by-the-sea, facing East and overlooking vistas of Eastonâs Pond, First Beach, and St. Georgeâs School. Move in ready, this property in the Kay/Catherine neighborhood, is within walking distance of town, the beach, Cliff Walk and Newport's many amenities. Newly refurbished wood clapboard exterior, high ceilings and honey pine floors throughout. The main floor has front and back entries, 4 fireplaces (3 w/gas log), a double parlor, dining room, study, half bath, pantry, and gourmet kitchen with sliders to a deck and entry to a fenced, landscaped garden with a brick area for BBQ. Upstairs are 3 bedrooms that share a bathroom and spacious laundry room. The Master Bedroom has its own bath and stair to the kitchen. The large basement has a cement floor, a new gas furnace and easy access. Gas heat and AC. Off-street parking for two or more cars. A separate guest house has its own water view, lots of light. and two sets of sliding doors â one that steps out on the deck and the other is a private entrance. Inside is a studio space with a kitchenette and small bathroom. For history buffs: The house was moved to its present location in 1883 and is one of the oldest on Eustis Avenue. Supposedly, the poet Henry Longfellow rented it when it was part of a complex known as "Cliff House," formerly located on the site of "Faxon Lodge," off Cliff Avenue, on the other side of Memorial Blvd. The house may date back to the 1850's.